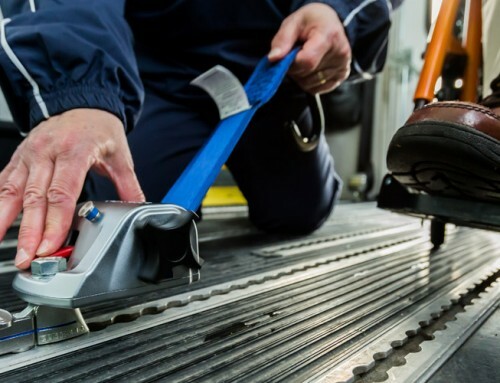 With safety as the number one priority in wheelchair transportation, the Rehabilitation Engineering Assistive Technology Society of North America (RESNA) updated the WC18 standards for wheelchair tie-down and occupant restraint systems (WTORS) which will take effect in December 2015. Currently, WC18 requires that WTORS withstand a sled impact test using a 30mph/20g crash pulse, a 187 lb. surrogate wheelchair and a 170 lb. midsize adult male crash-test dummy where the lap belt is anchored to the vehicle. Since new WC19 standards now require the availability of an optional wheelchair–anchored lap belt to hold the occupant into place, RESNA had to address the higher wheelchair forces that would be transmitted to the tiedown/securement systems when a person riding in a wheelchair is using that lap belt. As a result, RESNA developed the new WC18 standard requiring that WTORS must also be able to withstand the increased forces generated in a second impact test, in which the 170 lb. crash-test dummy is restrained by a lap belt that is anchored to the surrogate wheelchair rather than to the vehicle itself. Q’Straint has embraced the new WC18 standards by developing and offering the QRT-360, the first retractor to meet the requirements, which demonstrates the company’s increasing commitment to the safety of travelers seated in wheelchairs. The QRT-360 is the first 4-point, heavy duty, fully automatic retractable tie-down system designed, engineered and built to perform successfully in the required 30mph frontal crash when a wheelchair passenger is traveling in a motor vehicle and is using the optional lap belt as discussed above. It also offers a shortened retractor footprint that allows for more flexibility in vehicle anchor-point locations to better accommodate large wheelchairs. The revolutionary new product is therefore compatible with the widest variety of wheelchairs and is an acceptable solution to wheelchair securement in all types of motor vehicles. In addition, the self-tensioning tie-down system automatically tightens the straps during small wheelchair movements that occur during travel to eliminate slack. The belts continue to tighten during low-g vehicle accelerations, thereby further reducing the potential for wheelchair movement in the event of a collision. The webbing used in this system has also been redesigned and is twice as strong as the material used with other wheelchair and occupant restraint systems. As background, WC19 was the first industry standard in the U.S. for wheelchair manufacturers to address the design and performance of wheelchairs used as seats in motor vehicles. WC18 governs the systems used to safely secure the wheelchairs within the personal or commercial vehicle.